New speed record: 9 days between motor controller designs. 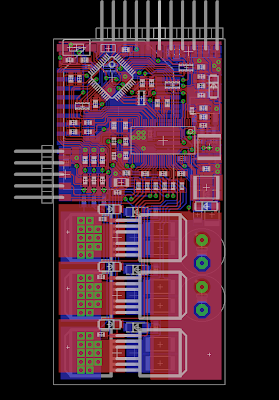 3ph v4.0 was finished up last week, and even though it's an x.0 and I sometimes have bad luck on new major versions, I am pretty confident in the design overall. Pushing the 3ph line back to optically-isolated gate drive puts it in the same class as some of my most reliable controllers to date, such as Cap Kart's half-bridge, the Victor 883107-7, and 3ph v2.1. It's a low-risk modification that I think will pay off in cleaner analog signals and higher reliability. And now that 3ph has become the stable design, I need a new experimental design. I've been meaning to try out a motor controller based on the Texas Instruments DRV8301 since it came out. This "everything chip" combines a three-phase gate driver with two current shunt amplifiers, an on-board gate drive supply with charge pump, and a separate buck converter for powering external logic. It seems too good to be true. 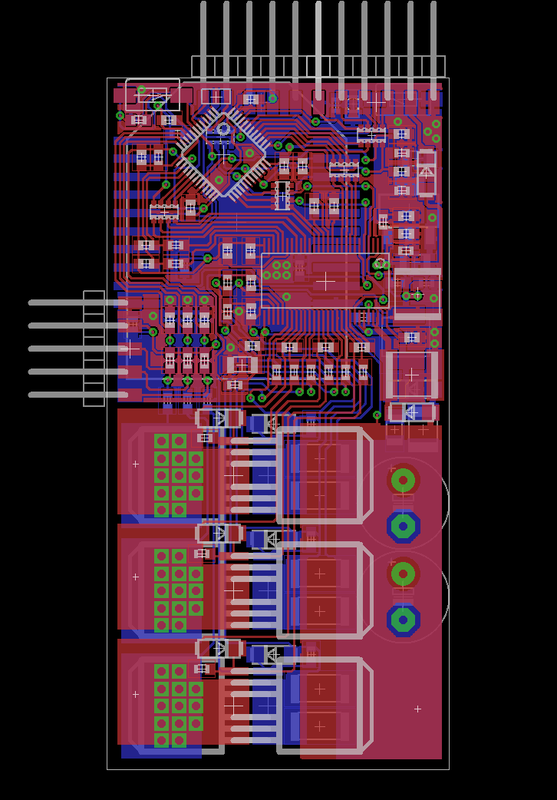 I've also been meaning to build an motor controllers to satisfy the requirements of RC aircraft, which is no easy task. I am much more at home with vehicle controllers where I can afford the weight of giant heat sinks, and the volume of separate logic and power boards, and the cost of fully-isolated gate drivers. But my RC friends have been urging me to try to execute advanced BLDC control with the power density and economics of commercial ESCs. Some clever people sent me a Cinestar 6 hexrotor frame, complete with motors, knowing that I wouldn't last long before deciding to build custom ESCs for it. To be fair, the commercial ESC that goes with it, a MikroKopter BL-Ctrl v2.0, is way more compact than anything I would make. But, it's an ATmega168/328-powered-square-wave-drive-ESC-with-direct-battery-voltage-derived-discrete-component-gate-drive that I can't bring myself to use. MOSFETS: IRFS3107-7 (75V) or IRFS3004-7 (40V), depending on the application. I love the D2Pak-7's. Cap Kart (all 300A of it) runs through four of these in parallel. There will be no heat sink other than the copper on the board and the wires coming off it, so I'm entirely relying on the low Rds to keep it cool. It's a heat-shrink-to-waterproof-style design. Gate Drive: DRV8301, the everything chip, a 2A gate driver and a risky bet. I'm generally not a fan of everything chips because they put power and signal together in a way that makes EMI isolation very difficult. But it can't be any worse than driving MOFET gates directly with an ATmega328, right? I hope? Current Sense: Two phase return current shunts, plus the internal amplifiers on the DRV8301. This is my first attempt at using current shunts instead of Hall effect sensors. Pros: potentially more accurate, conducive to synchronous sampling. Cons: Not isolated. That risk seems to roll up into the overall DRV8301 risk. 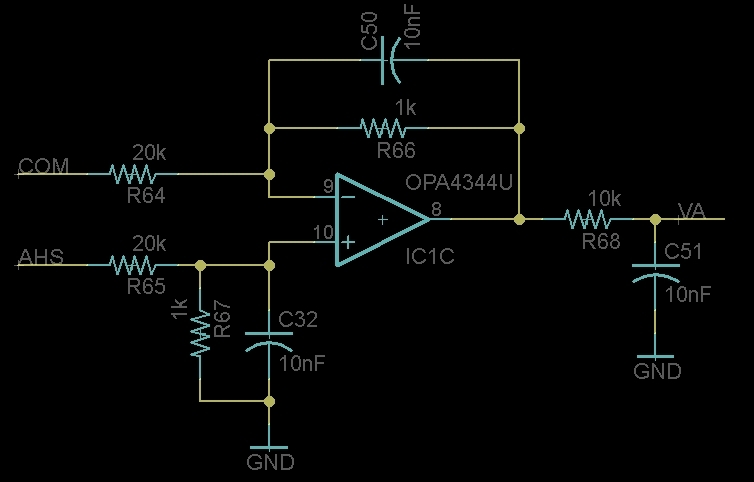 Logic Supply: The last trick up the DRV8301's sleeve, an on-board buck converter. It already has an internal gate drive supply, but this extra buck converter can be used to power the logic at 5V. It's compact and relatively beefy: up to 1.5A output. Micro: Would I use anything other than an STM32F103 at this point? I can directly port SSCFOCC over to this controller, although it will need considerably work to get up to the commutation frequency required to drive high-speed outrunners (target: 1200Hz). This is the first motor controller I've done with an integrated STM32F103, not on its own separate logic board. Noise is by far my biggest worry. 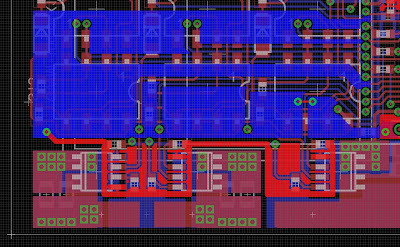 Every pin going toward the gate driver has a resistor in series with it and I do my best to keep the grounds separate, but I won't sleep as well as I do with optically-isolated gate drive and separate logic boards. The board can be programmed either with a standard FTDI adapter or no-touch over XBee. I was a little annoyed to find out the the FTDI adapters don't use RTS and DTR, the two useful signals for triggering the bootloader. They use CTS and DTR, and CTS can't really do anything. Why, Sparkfun, why? I guess it matches the FTDI cable. Why, FTDI, why? Anyway, this necessitates a boot mode button for wired programming. The XBee can handle DTR and RTS, so it can do completely wireless no-touch programming. 1206 resistor network to the rescue. Of course, the goal will be to demonstrate SSCFOCC in a direct side-by-side comparison to a commercial square wave commutation, fixed-timing ESC. One nice thing about propellers (as opposed to scooters) is that they provide a very repeatable load that is (in the case of static thrust, as on a multirotor) only a function of RPM. So, I will consider the project a success if I can run the same motor and prop to the same RPM with less power input than a square-wave controller at optimal timing. Or maybe, to demonstrate the benefits of field-oriented control, run at several different RPMs in a reasonable operating range and show greater total efficiency. There's a lot of work to be done on the way to that goal, though. So far, I haven't had much success with high-RPM field-oriented control. My RC car sort-of did it, but that was with Hall effect sensors and the rotor angle was still way off, so the efficiency sucked. I believe it's mostly a matter of filters and control, accounting for any sources of lag that the field-oriented control doesn't automatically take up. That, and pushing the control loop up to 32kHz, should be able to make it work. Fun. For now, I can at least take a short break from EAGLE while I wait for the boards. I've finally nailed down working Sensorless Sine-Commutated Field-Oriented Current Control (SSCFOCC) for Pneu Scooter, and I promise I will write up this (relatively) simple algorithm sometime soon before moving on to more complex closed-loop observers and other controls-y things that won't be of much practical advantage over this simple one, at least not for a while. MOSFETs: This design still uses the GWM series miniature 3-phase full bridge modules from IXYS. Specifically, the GWM100-01X1, although it could also use the GWM160-0055X1 or the GWM200-004P3. They're hard to find, but I've stockpiled enough to survive until the end of the world. Logic: Still using the STM32F103 on a Wootstick 2.0 because why would I change that? Current Sensors: Two phase current and one DC current sensor using the ACS714 Hall-effect current sensors. They measure +/-30A, so in order to get to full operating current I can selectively bypass them with one or two 0.001Ω, 1% resistors each. It's a fact of life that the current sensors, particularly the phase current ones, need to be located directly adjacent to high dV/dt switching nodes. High dV/dt leads to capacitive coupling, and one way to protect sensitive traces from capacitive coupling is to shield them with ground planes. So, in an effort to minimize capacitively-coupled PWM noise on the current sensor signal wires, I did my best to shield the signal side of the ACS714's and the traces returning to the logic part of the board with ground. I don't know how much it will help, but it probably can't hurt. The input AHI is a 3.3V logic signal directly from the STM32F103. If AHI is high, the high-side optocoupler LED turns on. If AHI is low, the low-side optocoupler LED turns on. 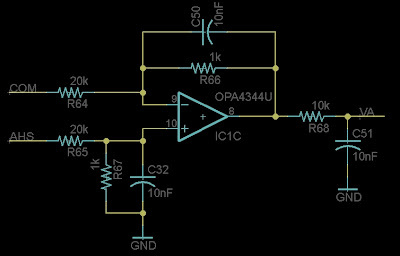 If AHI is high impedance, neither LED turns on and the half bridge is disabled. R69 and C54 form a low-pass filter that sets the shoot-through delay. Each gate gets a gate resistor, a pull-down resistor, and a 17V Zener diode. D2 is the bootstrap diode for the high-side driver. Differential measurement with respect to power ground (COM) should be more accurate when high currents push power ground and signal ground apart. Phase voltage sensing opens up a number of interesting opportunities for 3ph v4.0. One is simple block-commutated sensorless, where one phase is left undriven (which I can do now, thanks to the tri-state-able optocoupled gate drive) and the back EMF is directly measured. I'm not sure why I would want to do this, other than for direct comparison to more advanced sensorless techniques with the hardware as a control. Besides block commutation, measuring phase voltage may also be useful for rolling-start, which is something I do a lot on the scooter. 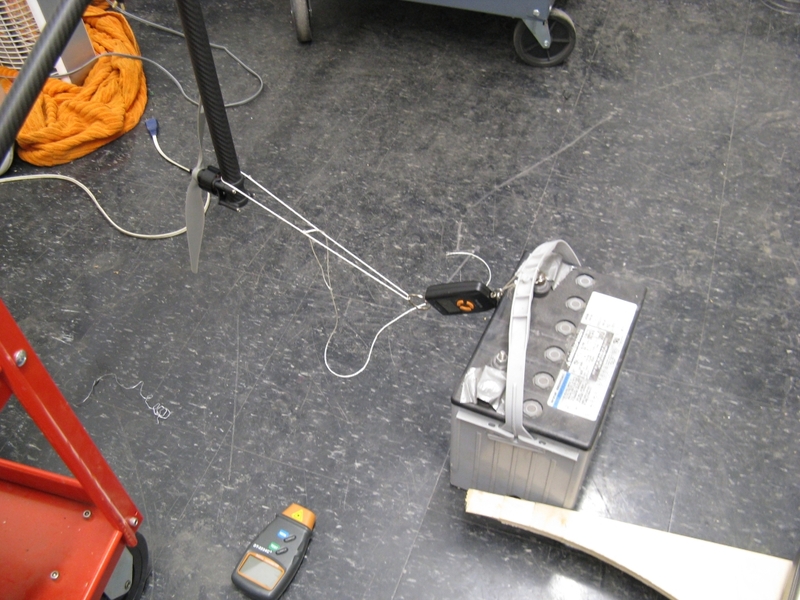 Right now, I have to push against the resistance of the shorted motor until the current sensors pick up enough information to derive the rotor position. It finds itself at a very low speed, so this isn't a big deal. But, with phase voltage sensing, I could leave the phases off and use the back EMF measurement to do the same. The practical advantage is that you can freely kick up to any speed before applying power. 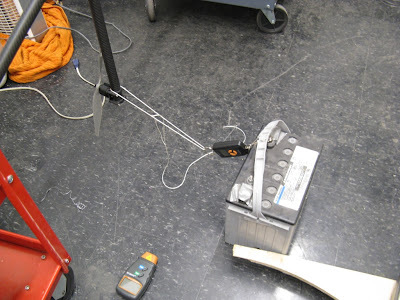 Another thing phase voltage sensing might be useful for is online or offline calibration, where the back EMF is measured and used to estimate the motor's torque constant or other parameters. At very least, it could be used as a single-purpose scope to make a plot of the motor's back EMF waveform, which is informative by itself. I managed to cram the entire 15V and 5V power supply on the bottom layer, this time with ceramic capacitors. The six gate drive optocouplers barely fit on the top layer above the MOSFET. All the filters and logic are on the top layer under the STM32 board. There are also still inputs and filters for Hall effect sensors, even though I mostly plan to use this for sensorless control. I'll sent these boards out right after the holiday weekend and as usual, post the schematics and other files when I confirm they work. Of course, the first sub-version of my boards are usually doomed to failure (3ph v2.0 and v3.0 didn't last very long, whereas v2.1 and v3.1 were great) so we'll see what happens. Cinestar 3-Axis Gimbal (Snow): Watch this in HD, with huge speakers. Now. It's impossible to explain in words how amazing it is. This is the Cinestar 8 with a 3DOF camera mount. A Swarm of Nano Quadrotors: This was viral, so you may have seen it already. The Aggressive Maneuvers group from UPenn's GRASP Lab has released their newest video, which is near and dear to my heart because it uses nano quadrotors. 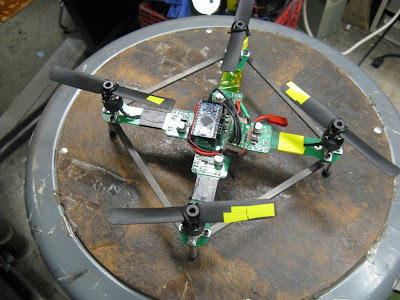 Nanocopter: Based on the OpenPilot platform, this one of the smallest quadrotors ever made. It's way smaller than 4pcb (2/3 the size and 40% the weight). The challenge is also issued for anyone to make a picocopter with 2" props. Tricopter: A tricopter is an interesting controls problem, because it requires at least one servo to give it independent yaw control. This one is particularly light and stable, and has gone through many iterations to get better and better. The thing I learned is that there really isn't a winning strategy in Battle Quadrotors. Anyway, the miniature and nano-scale quadrotors tend to be very robust, so neither suffered major damage. Which got us thinking: what would it take to kill a miniature quadrotor? Oh...that'd do it. The Tesla coil, built by Daniel K., emits enough EMI-inducing field to mess with sensors and possibly even radio control, but that's if it doesn't simply strike your airframe with an arc instead. Sticking with the theme of destruction, there was a brief period of nice weather (nice = 45º and not windy) where I was able to fly one of my new flying things, a Hacker Skyfighter from Ryan A. I have only ever flown a small, ultra-stable indoor plane, so this was going to be an interesting challenge. It's a flying wing, and set up for aerobatics. So if it looks like I know what I'm doing, rest assured this plane cannot help but do loops, rolls, and various other stunts while I try frantically to point it upwind and fly it away from the running track and back to the baseball field where I started. But, I will practice more and one day be good enough to actually land it. For now, though, back to multirotors. 4pcb has always been plagued by frame vibration issues, since it's made only from 0.063" FR4. I can see the props and motors wiggling when the frame hits resonance, and it certainly messes with the gyro readings and makes it more difficult to fly. Through a combination of mechanical and software measures, I've made the control mostly immune to these vibrations, but I thought it would be interesting to try to see the magnitude of the problem more directly. 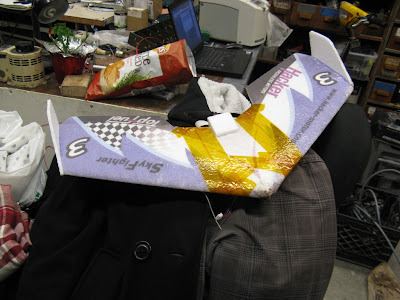 This definitely stiffened up the frame, but it didn't actually fly better. For one, I've mostly solved the gyro noise problems already, so any gain achieved by reducing vibration will be marginal at this point. 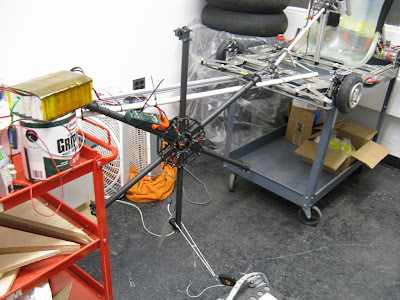 Additionally, the extra weight and airflow disruption from these supports may have been enough to push some of the motors closer to saturation, making the control feel softer. So I took them off. In general, 4pcb's motors are running too close to the control limit (hover is just under 200 out of 250 on the throttle at full battery voltage). I replaced one motor that had bad bearings, and the motor I put in its place was weaker than the other three and saturated the control output all the time. After a day of troubleshooting, I swapped the motor yet again and now they are more well-matched. Still, when the battery begins to get low, one motor will saturate and cause it to feel very soft and drifty. Lighter weight. 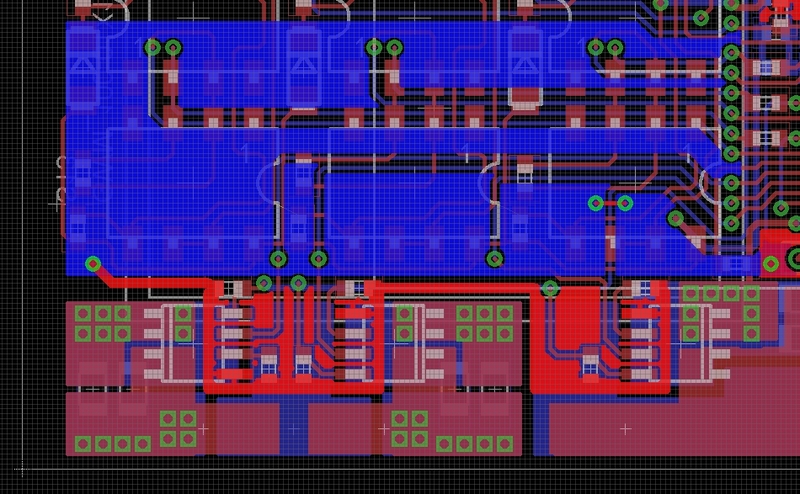 Microcontroller and power wiring integrated onto the board. Higher voltage (11.1V instead of 7.4V). This will help with command saturation, giving more thrust margin for the 2000rpm/V motors, and keep the voltage away from the Toshiba chip's 7.0V minimum. To maintain the weight goal, it will have to be a lower capacity. But with a higher input voltage, the ESCs will draw less battery current, so flight time should be similar. Closed-loop velocity control. No more motor matching. The Toshiba chips have a tachometer output that can be used as feedback to control prop speed, instead of open-loop motor terminal voltage. It will also have provisions for altimetry and possibly a small camera mount. 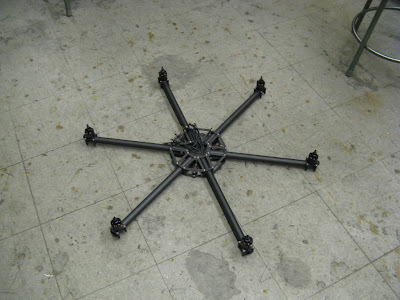 The frame + motors weighs 1.5kg. So even after adding in the props, ESCs, control board, and a reasonably-sized battery, it has enough thrust to carry some pretty epic payloads... I am both terrified and excited to see it flying.